Performance of Hectare: About 6000 kilos on medium mixed land at 350 mt s.l.m. Harvest period: from the first week of September it occurs a manual harvest in 200 kg volume bins. Vinification: After a 12 hours storage in refrigerating room, grapes are softly smashed in reducing environment and the must ferments at a low temperature for about 15 days. The refinement occurs in steel oltanks on fine lees for about 7 months, after being bottled it will be necessary an additional month of storage to get the definite organoleptic ripening. 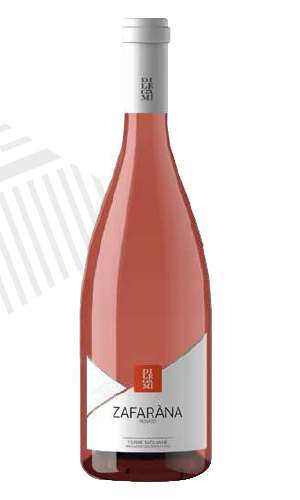 ORGANOLEPTIC FEATURES: Soft rosè wine with fucsia highlights. From the olfactory point of view there are captivating fresh and fruity scents that remind of strawberry and pansy but there are also fine and persistent tropical fruits. The present alcoholic note is softened by a good mineral-based freshness which gives to our wine a good flavor and olfactory persistence. Thanks to its suitability this wine can be combined with cold cuts and cheeses-based starter. It accompanies pasta-based main course, also with vegetables, or white-meat second courses or fish such as prawns and swordfish.